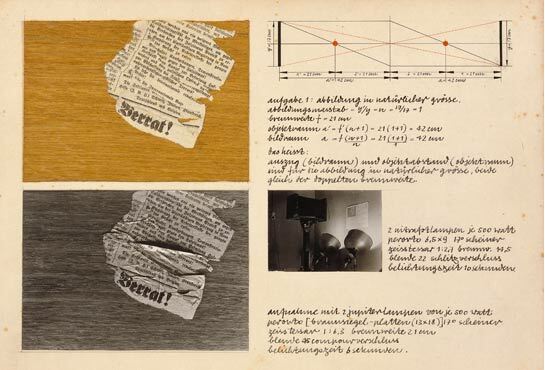 One highly influential legacy of modernist photography in central Europe is darkroom experimentation, which in the eyes of theorists and practitioners represented a key path for “truly modern” photography. Innovative methods were not kept private in artists’ ateliers, but instead were taught to rows of willing students in art schools from Berlin to Lviv, Prague, and Bratislava; the results were also put on view in gargantuan didactic exhibitions mounted across the region. Among the schools, the most famous was the Bauhaus, which thrived in various German cities from 1919 until 1933, when it was forcibly closed under the new Nazi regime. Walter Peterhans taught photography classes at the school, encouraging students such as Theo Ballmer to concentrate on the subtleties of texture, translucency, and tonal gradations; Ballmer’s classroom exercise, which includes careful notations as to lighting and exposure, inventively compares the qualities of an actual, crumpled newspaper clipping on real plywood with its photographic reproduction (below). For his standards, Peterhans looked to the daguerreotype and other nineteenth-century processes, and he was by no means alone. Call 414-224-3842 or email grouptours.mam.org for your inclusive package at $22 per person (includes Foto exhibition, docent and/or audio tour, and a box lunch).